Heat oven to 375°F. Pierce potatoes with fork. Place potatoes on middle oven rack. Bake 1 hour to 1 hour 15 minutes or until fork-tender. Cool slightly. Increase oven temperature to 450°F. Cut each potato in half lengthwise. Scoop out insides, leaving thin shell. In medium bowl, mash potato insides until no lumps remain. Beat in yogurt, onion, salt and pepper until light and fluffy. Stir in broccoli and pimientos. Spoon mixture into potato shells. Place on ungreased cookie sheet. Bake uncovered about 10 minutes or until hot. To microwave potatoes, pierce potatoes with fork. Microwave uncovered on High 7 to 9 minutes, turning potatoes over after 4 minutes, until tender. Let stand 5 minutes. Mash and fill potato shells as directed. 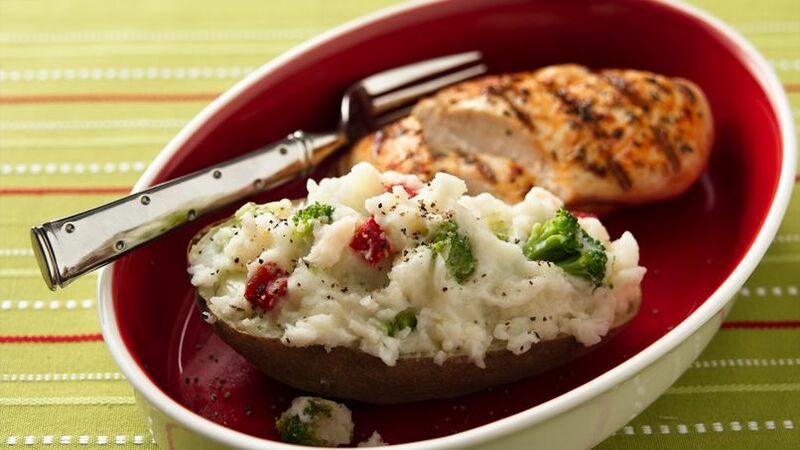 Arrange stuffed potatoes in circle on 10-inch microwavable plate. Cover with waxed paper and microwave on High 2 to 3 minutes or until hot.